Teaching and learning computer programming has posed great challenges for both instructors and students. 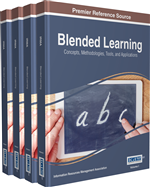 An emerging blended learning mode - polysynchronous learning has potentials to motivate and engage students in the programming learning process, to optimize students' programming learning experiences, and to transform the computer programming teaching and learning. This paper aims to integrate the polysynchronous learning, as a communication model, with the student-centered learning, as a pedagogical approach, to design a graduate-level course - App Design and Development. The authors primarily focuses on describing my decision-making process of the physical environment design, the technologies and tools selection, and the polysynchronous learning activity design, as well as specific details regarding these three aspects. Moreover, potentials, challenges, and implications of applying the polysynchronous learning to foster the student-centered learning in the higher education context are discussed. Teaching and learning computer programming languages has posed great challenges and difficulties for both instructors and students (Kelleher & Pausch, 2005; Teague & Roe, 2008; Wang &Wong, 2008). Students need to learn abstract programming concepts and syntaxes, which has been widely recognized as a highly cognitively demanding task (Lau & Yuen, 2009); more importantly, students need to apply these abstract concepts and techniques to solve practical problems in their practices (Brito & de Sá-Soares, 2014). Therefore, the instructor not only needs to introduce students with abstract programming concepts and syntaxes, and help students cultivate the logic computing thinking, but also need to motivate students to apply these concepts and techniques in practical learning activities. A variety of teaching and learning approaches have been utilized in teaching computer programming courses in the face-to-face, blended learning, and online learning environments; varying results regarding students’ learning experiences, performances and satisfactions have been reported. A majority of studies in this field indicate that blended or online learning environments have posed positive influences on students’ learning experiences and satisfactions, but it is not sufficient for students to learn and master programming; and the face-to-face instruction is still an effective component for teaching and learning programming (Bliuc, Goodyear, & Ellis, 2007; Cakiroglu, 2012; Hadjerrouit, 2007; Stacey & Gerbic, 2007). Therefore, innovative pedagogical approaches need to be introduced to transform the computer programming teaching and learning. An emerging blended teaching and learning modality - polysynchronous learning (Dalgarno, 2014) may have potentials to achieve qualitatively different experiences on computer programming teaching and learning. Dalgarno (2014) defines that the polysynchronous learning is the integration of learner-learner, learner-content and learner-instructor interactions through a blending of multiple channels of the face-to-face, asynchronous online and synchronous online communication. In the polysynchronous learning environment, multiple interaction streams (i.e., the face-to-face communication, the online synchronous, text-based, audio, and video discussion, the online asynchronous discussion) can afford varied opportunities for students to engage in the collective inquiry and interactive learning. Due to its unique interactive attribute, the polysynchronous learning, as a communication model, could be integrated with the student-centered learning, as a pedagogical approach, to transform the traditional computer programming teaching and learning. The student-centered learning is defined as the ways of thinking and learning that emphasize students’ responsibilities in learning (Cannon & Newble, 2000). In the student-centered learning, students should take a high level of responsibility on initiatively choosing their learning goals, and actively managing their learning (Sparrow, Sparrow, & Swan, 2000). It has been proven that properly implementing the student-centered learning approaches can lead to increased motivation to learn, greater retention of knowledge, deeper understanding, and more positive attitudes towards the subject being taught (Collins & O’Brien, 2003; Felder & Brent, 1996; Fernández, Díez, Zarraonandia, & Torres, 2011). To date, very few studies have employed the polysynchronous learning to foster student-centered learning in the authentic learning environment. My blended course design on App Design and Development initiates one step towards the purpose to transform teaching and learning computer programming in the higher education. My primary design purpose is to integrate the polysynchronous learning mode with the student-centered learning in order to foster students’ interaction and collaboration in the learning process, to help students achieve a qualitatively different learning experiences, and to transform the computer programming teaching and learning.